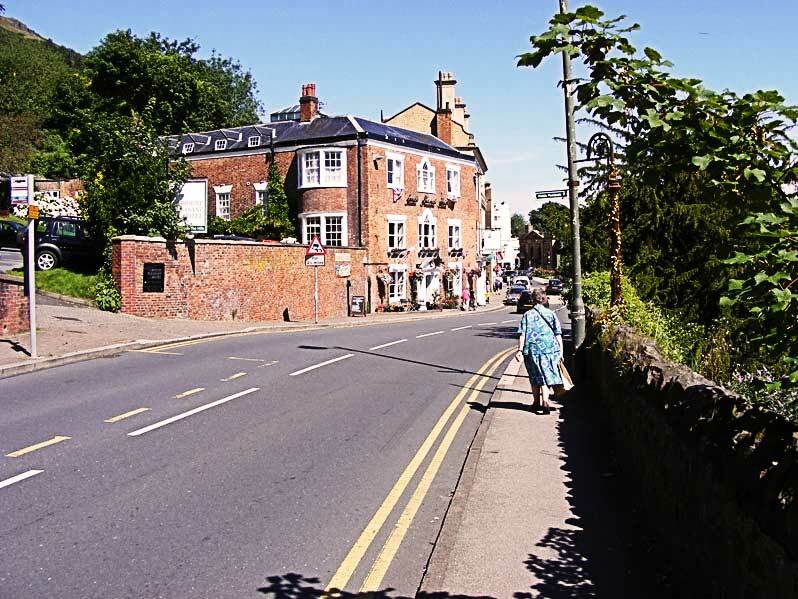 This page continues our stroll and records our perambulation northwards along the Wells Road, which becomes the Worcester Road, from its junction with Abbey Road back to Great Malvern Post Office. The panoramic photo above shows the east side of some of the buildings you will pass, Cherbourg House, Southlands, a chapel and an archway linking to villas next door. (The photo was taken with a x10 zoom lens from the B4211 Guarlford Road). Since this photo was taken Audley Group Ltd have commenced renovating the buildings in order to create a large retirement village on the site, known as Audley Ellerslie, and a third block of apartments has been built between Cherbourg and Southlands. We missed it first time round, but an 1884 map of Great Malvern shows a large house, 150 yards or so along from Ellerslie with access onto the Worcester Road opposite the turning to the Wyche cutting. This was probably built about 1850 and known as Cherbourg House. Pevsner describes this as Italianate with five bays. Viewed from the eastern approach to Malvern it is a significant landmark but was empty in 2015 and in a poor state of repair, awaiting modernisation. You can't see much of Cherbourg House from the Wells Road, but the illustration opposite, which was cropped from the panorama above, shows the east side and part of the extension on the north side, which is a later addition, linking the building to Southlands next door. A trade directory of 1862 records Mr Matthew P W Bolton in residence. Matthew Piers Watt Bolton, or Boulton, (1820-1894) was the grandson of Matthew Boulton an English manufacturer and business partner of famous Scottish engineer James Watt. Sadly his first wife Frances Eliza Carter nee Cartwright died at Great Malvern on 19th January 1864. The family's main residence was at Tew Park in Oxfordshire. In the 1880s Cherbourg House became a school run by Frederick William Young and Arthur Vernon Vines who also had buildings nearby at North Leasowes and Norfolk Villas. Ernest Wright Alexander VC (1870 - 1934) was a pupil who went on to Harrow; his father Robert, born in Belfast but based in Liverpool, was a prominent ship broker and a Director of the Suez Canal Company. 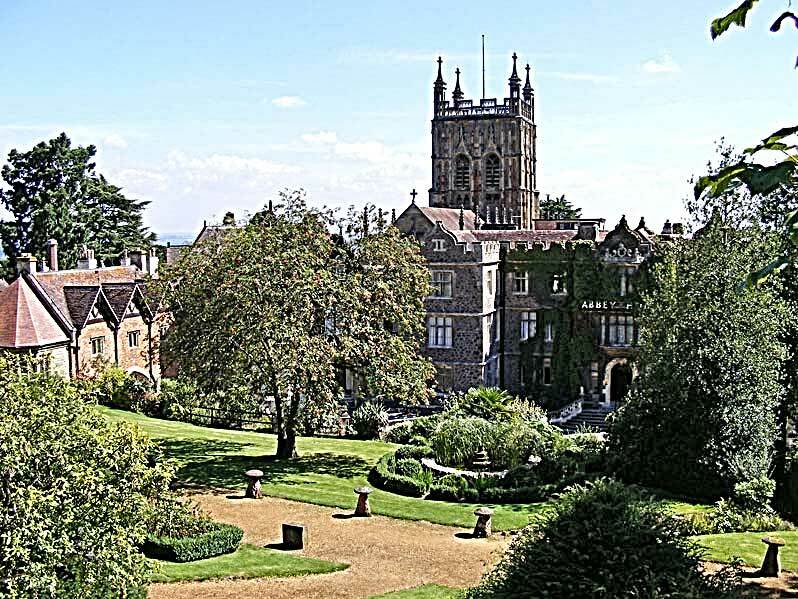 In 1911 Arthur Clement Allen was the headmaster at Cherbourg House; the author C S Lewis apparently enjoyed going to school here, before being educated at Malvern College. A 1934 map of Malvern shows an additional building north of Cherbourg House known as Southlands. This could also have been built about 1850 but possibly later. Ellerslie, Cherbourg House, Southlands and Hampton House (see previous page) had all been acquired by Ellerslie school for girls during the twentieth century. Circa 1992 Ellerslie school was taken over by Malvern College, and since becoming surplus to requirements the land was sold to a developer. Planning permission for a retirement village, now known as Audley Ellerslie, was granted by the MHDC in 2012 and in 2017 work was well underway. 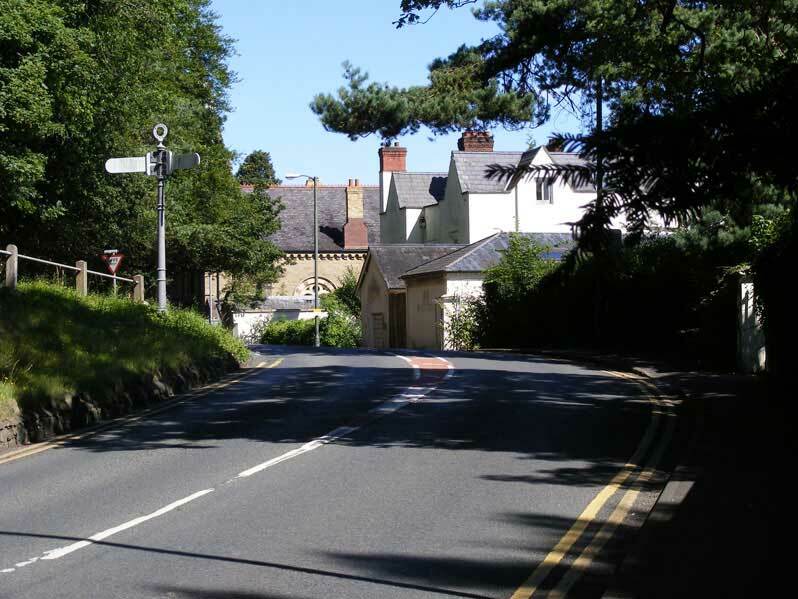 The photo below shows the junction of Worcester Road with the Wyche Road which runs over the Malvern Hills to Colwall. Ahead can be seen an arched window in the wall of an old chapel whose tower is hidden behind the trees on the left. The building in front is Southlands. 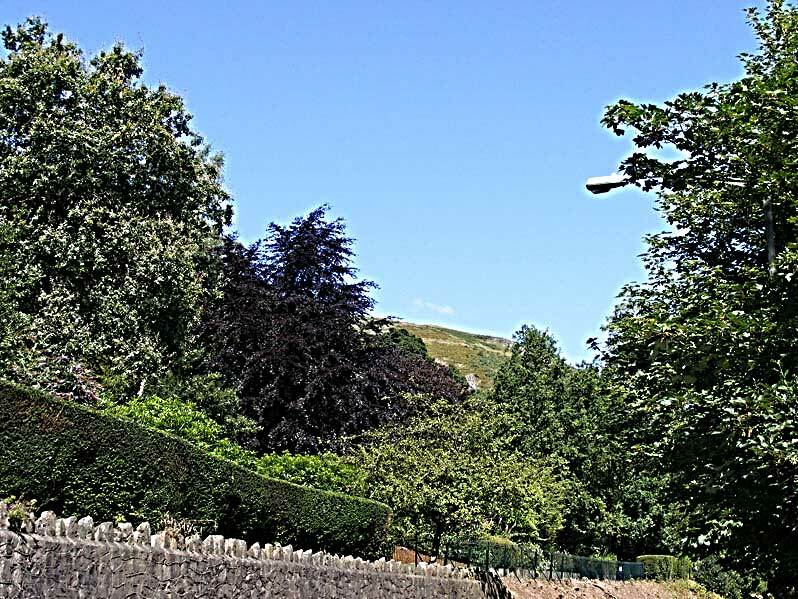 At the very right of the photo below can be seen one of the white gateposts of the old entrance to Cherbourg House which sits on the slope below the road. A few steps further on the tower of the chapel is revealed. The present Chapel designed by Herefordshire architect Henry Haddon, was built in 1874 and replaced an earlier chapel of brick construction erected in 1827. It was a chapel of the Countess of Huntingdon's Connexion, which was part of the Methodist movement. It became known as Emmanuel Church, but is now the home of the Body Spirit Health Club which took over from Belle Vue Fitness and Beauty Centre (ref 5). 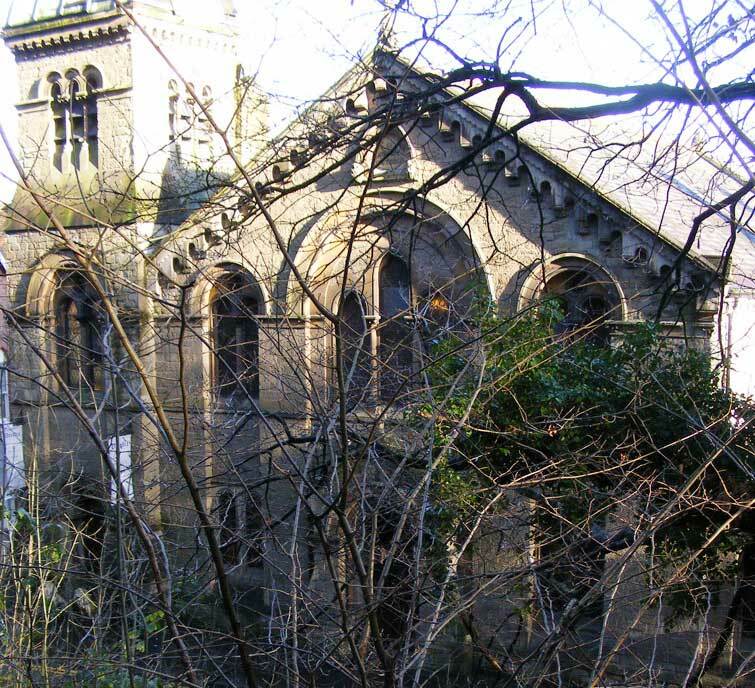 The photo of the front of the chapel (see photo below) was taken from across the road on the bank which runs below Rose Bank Gardens. Despite it being winter the building was still nearly hiddden by trees. The broad Lombardic detailed facade presents a rather surprising sight amidst the Victorian Villas of the Wells Road. Next door to the chapel was The Parsonage which in 1911 was occupied by Peter Rose aged 42 born Kelso, Roxburgh, Minister of the Gospel. It is from a small room below the earlier chapel that Miss Caroline Cooper (1821 - 1873) is said to have started her first school in the 1850s which later moved to Elmsdale and then Malvernbury in Abbey Road. The photo below was taken from the archway between the chapel and the block of villas next door, and shows the view looking east from the Wells Road towards Guarlford. The photo below was taken from the same vantage point but zoomed towards Christ Church in Avenue Road. The edge of Barnards Green can be seen on the extreme right of the photo. The 1828 Foley estate map in Gualrford village hall shows the early chapel near the turning to The Wyche and Dr Garlike's house which at that time was the only house set midway between the chapel and Belle Vue Terrace. Dr Garlike's property, known as 'Melton House' occupied a large plot of land between the (Wells) Worcester road and Abbey Road. According to Pevsner the house was built circa 1818, altered by GC Haddon in 1867 and again by Nevinson and Newton in 1894. The photo below shows the magestic house that stands there now. 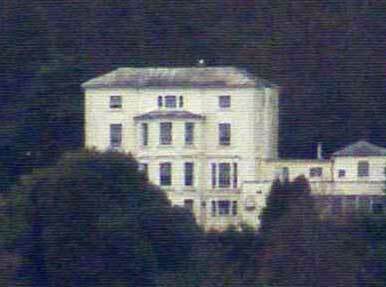 In 1911 the property was known as Melton Grange and occupied by Caroline Margaret Woods aged 84 of independant means. Melton Cottage of similar name was possibly built later in the grounds with access onto Abbey Road. In 1911 the property was occupied by Frederick Prosser, a retired college porter. Tudor House, Holyrood and Hay Well Baths (the latter replaced in 1894 by the Baptist Church). Warwick House would have existed but was not labelled. 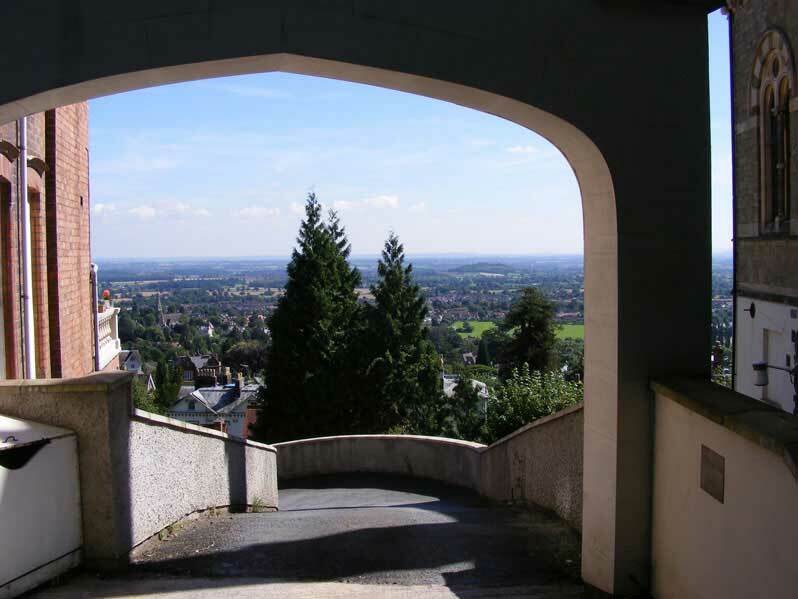 Nowadays you will find a series of slightly 'tired' Victorian villas linked together providing shade but blocking views of the Severn Valley; but for the fit and energetic, a splendid view can had in all directions from the Worcestershire Beacon above St Ann's Well. 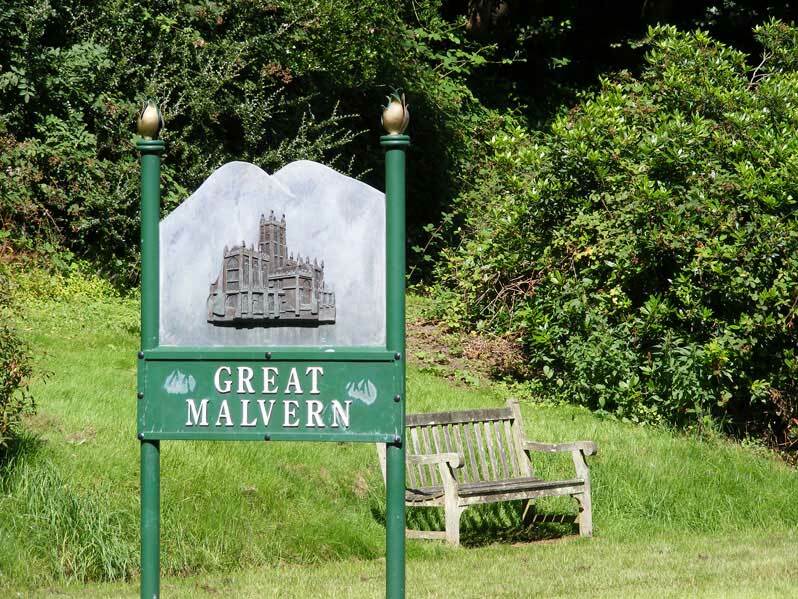 A little further along the Wells Road, on the left hand side is a bench next to the welcome to Great Malvern sign. On the right is 'Tudor House' by SS Teulon (see photo below taken from Rose Bank Gardens). This was built about 1852 for the water cure doctor James Manby Gully. red brick in lively jacobean style, with square bay windows, rusticated doorways, and tall chimneys. At the rear are two tall viewing towers which can be seen in the photo below. 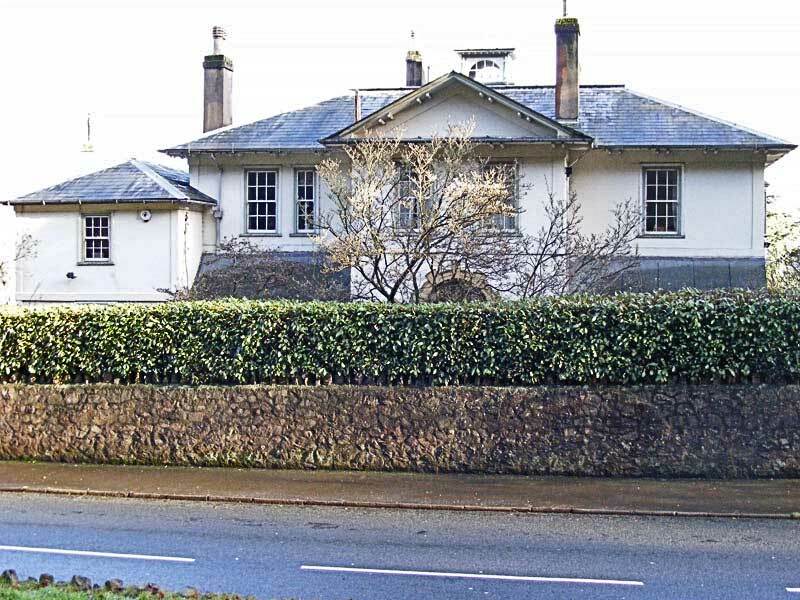 Next door is a white stuccoed Tudor Gothic building which was known as 'Holyrood House' built about 1840 where Dr Gully also practised (read more - link to article by Sue Young). So successful was his business at Holyrood that Dr Gully built or acquired Tudor House on land next door to accommodate the extra demand for his water cure patients. Dr James Manby Gully retired to London in 1872, and the water cure business was carried on by his partner Dr Fernie. 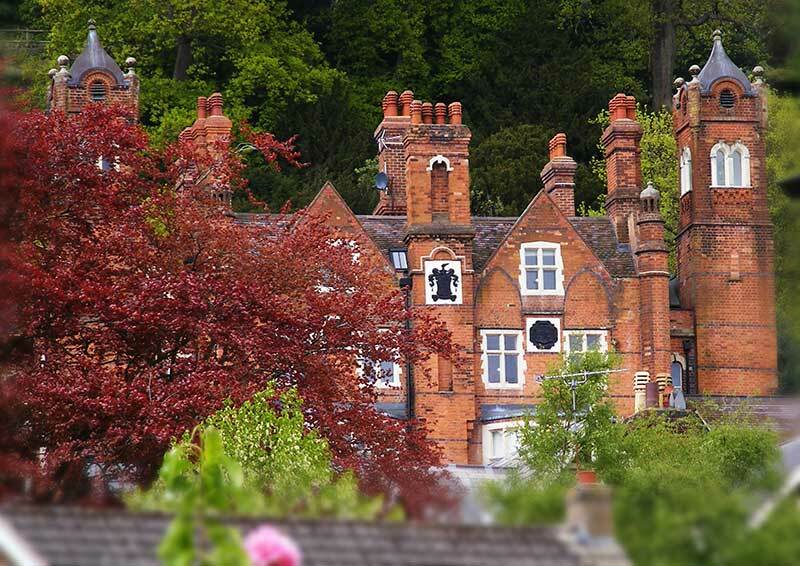 By 1879, hotel proprietor Elijah Finn, who also describes himself as 'Proprietor of the Haywell Baths', is running the Tudor House, and Dr Fernie is living in College Road. Elijah Finn, who died in 1886, had previously been a boarding house keeper at Dr Marsden's Hardwicke House in Abbey Road. The 1871 census suggests that Holyrood, next door, was already by then split into apartments run by lodging house keeper Catherine Brown, born Buckinghamshire, about 1827. Despite a serious fire in 2010 when the Tudor Hotel was empty, the property was renovated and converted into residential apartments circa 2012. The rear of Tudor House and its viewing towers can be glimpsed from College Road. See photo below taken following modernisation in 2015 when the crests on the rear of the building have been painted black. After Tudor House comes Holyrood House connected by a bridge with an arch below (not shown). Further on, and to your left, is a glimpse of the Malvern Hills beyond Rose Bank Gardens. The photo below shows the approach to Belle Vue Terrace, with the bus stop and entrance to Rose Bank Gardens on the left (just out of picture) and the Mount Pleasant Hotel. 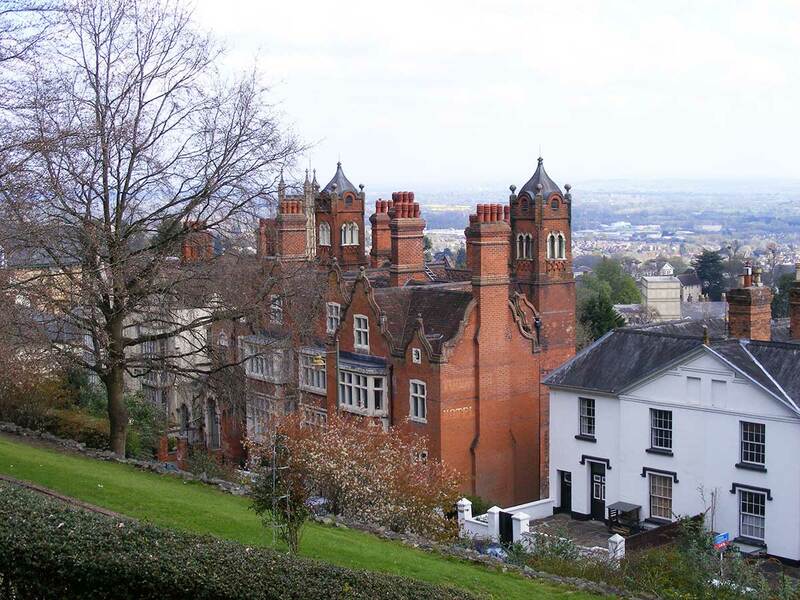 If you turn left into Rose Bank Gardens and follow the path along the boundary wall you will come to the 99 steps which lead to St Ann's Road and Foley Terrace; from there you can follow a steep zig-zag path to St Ann's Well. Be warned it's a stiff walk, so needs to be taken slowly by the unfit, but there is a cafe where you can reward yourself with a cup of tea or an ice cream, before venturing further onto the hills. On the right can be seen the Abbey Hotel Gardens, and the Abbey Hotel, with the tower of the Priory church of St Mary and St Michael behind. 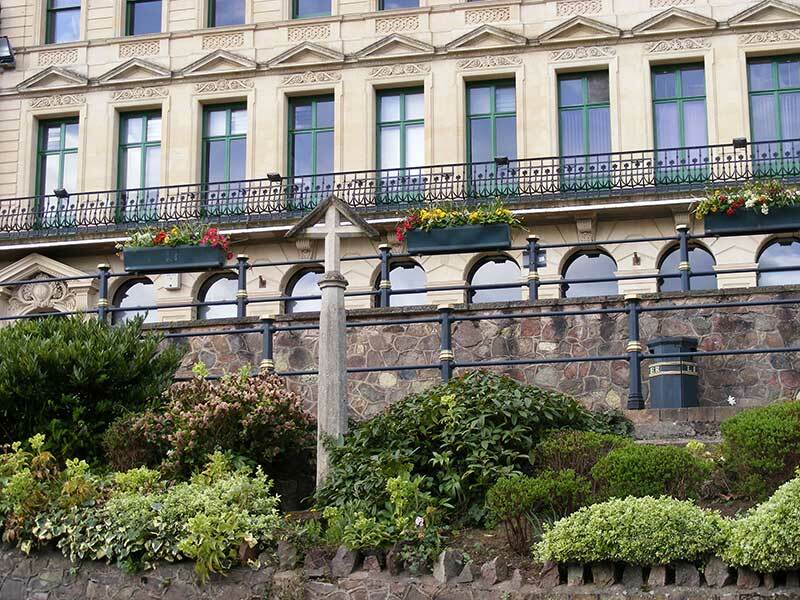 The photo below shows another view of the Mount Pleasant Hotel glimpsed from Belle Vue Terrace. You can drop in here for a coffee or a meal. 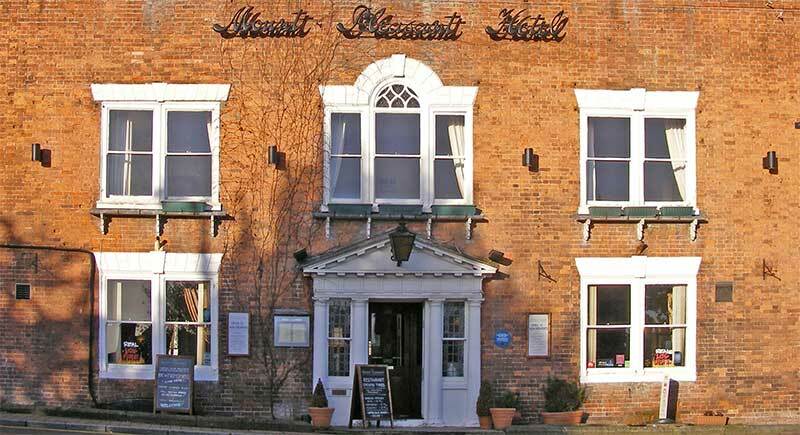 During the 1930s Dame Laura Knight DBE, RA, RWS, and Harold Knight, RA, stayed and painted here at the Mount Pleasant Hotel. Bearing right you will see Great Malvern Post Office where you started and the Tourist Information Centre beyond. 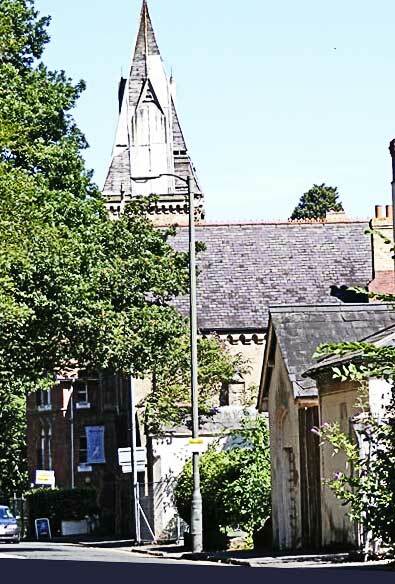 The Post Office stands on the site of the old vicarage, where Revd John Rashdall lived between about 1850 and 1856. If you look up to your left just before you reach the Post Office you will see the Market Cross towards the south end of Belle Vue Island. 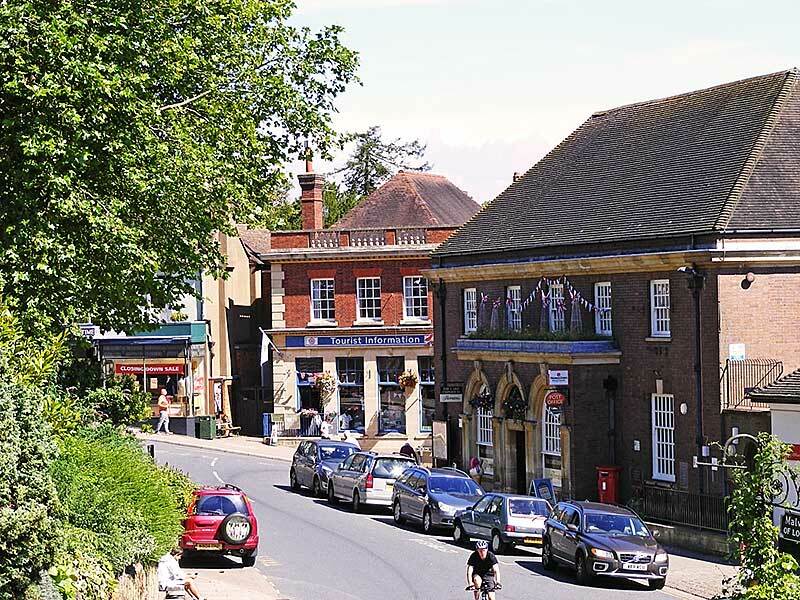 We hope you enjoyed this short 'virtual' stroll down Abbey Road and back via the Worcester Road to Great Malvern Post Office. Perhaps the photos of the varied Victorian buildings and snippets of information about the water cure doctors will inspire you to find out more into the history of the town. 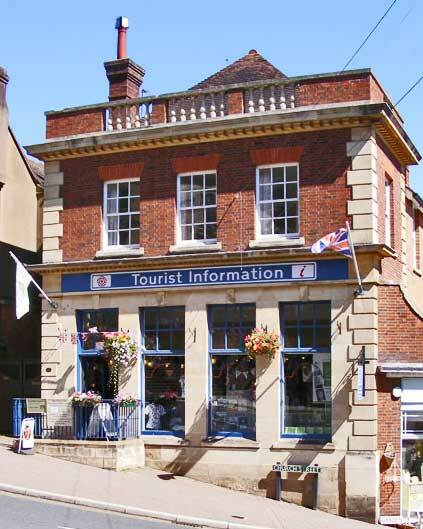 You can find out more about the local area by visiting the Tourist Information Centre which is currently located at the top of Church Street (see photo opposite); Malvern Museum at the Abbey Gateway; and the local reference section at Malvern Library. Books and booklets about the area can also be found in the 'shop' in Great Malvern Priory which is on the left as you enter the church, and at the Malvern Book Coop in St Ann's Road. 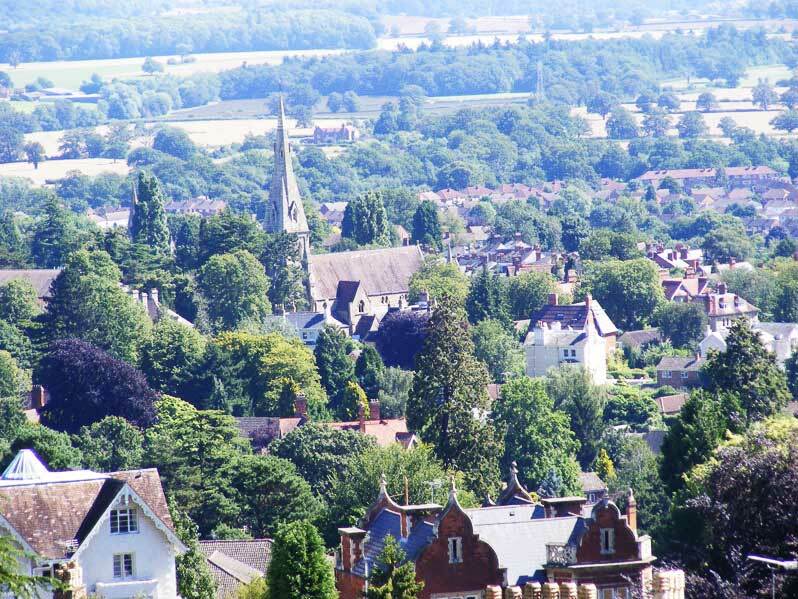 The 1871 census records, for this area of Great Malvern, do not appear to follow a logical sequence, so you may find the index of house names held by the Worcester Record Office useful if you are researching local history. Called a street index it actually lists property names in the order they were filed in the census books. The 1871 records fall under the Ecclesiastical District: St Michael and St Mary, census reference RG10/3053 (district 5). Stevens directories 1900 - 1930, held by Malvern Library, are another useful resource listing houses by their order in the street. These were the brainchild of MT Stevens who founded the Malvern Gazette. You can find out a little more about this area of the town by clicking the links below. 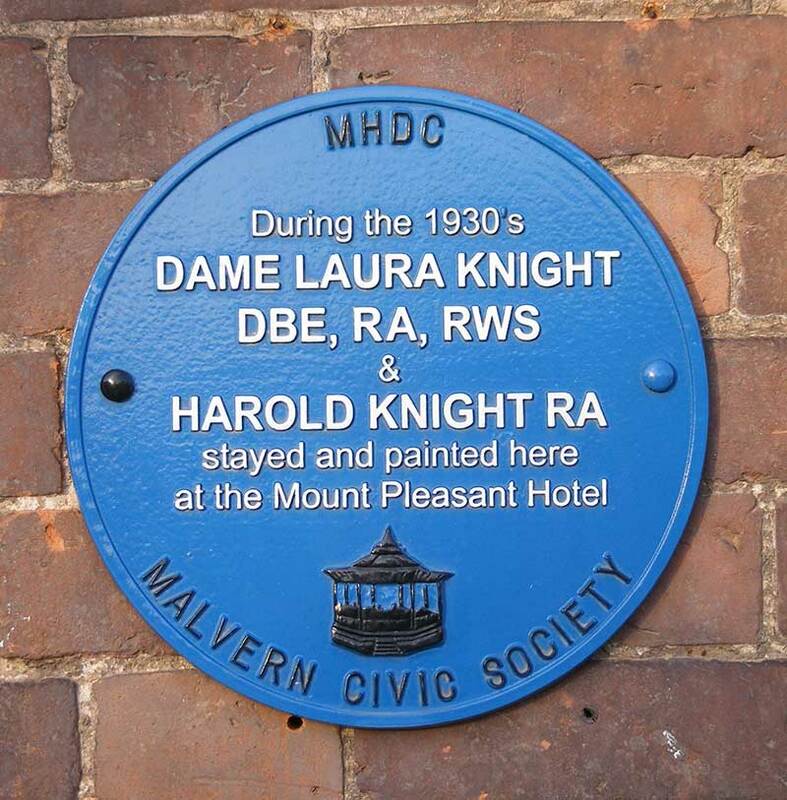 Malvern and its famous visitors, Malvern Civic Society, printed by Aspect Design; this contains a list of the many blue and green plaques which can be found in the town. Weaver Cora and Osborne Bruce, Aqua Malvernensis, a history and topography of the springs, spouts, fountains and wells of the Malverns, and the development of the public water supply, printed by Aldine Press, 1994. Hall-Jones Roger, The Story of Park View Malvern, published and printed by First Paige, Abbey Road, Malvern, 1998. Ellis Rod, Dissenters All, the story of the non-conformist churches of the Malverns, printed by Aspect Design 2008. Moody Catherine, Silhouette of Malvern from Queen Victoria to Queen Elizabeth II, The Priory Press, Malvern, 1953. Brooks Alan and Pevsner Nikolaus, The Buildings of England, Worcestershire, Yale University Press, 2007. Map of Foley Estate 1828. Grierson Janet, Dr Wilson and his Malvern Hydro, published by Malvern Museum 1998. Conolly Pauline, The Water Doctor's Daughters, Robert Hale, 2013.